Ah, autumn. A beautiful season made even better by book festivals taking place around the United States. 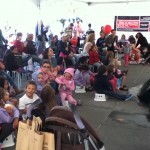 This year I was fortunate to attend two book festivals, one in Brooklyn and one in Baltimore. Both events were packed with people browsing, listening, looking, sharing their love of stories and information. A few weeks ago, Ariel Lawhon, author of The Wife, the Maid, and the Mistress and one of my Twittter friends, mentioned how much she enjoyed the Decatur, Georgia book festival. When I asked her what she liked best about it, she said, “It was brilliant. I love the sense of community at these festivals. It’s like a huge book hug.” Lawhon’s description of “a huge book hug” really resonated with me. We hear so often that people are reading less, but the crowds and the excitement at books festivals suggest the opposite. To me, the stacks of books, new and used, are like a huge feast, and I hardly know where to dig in. 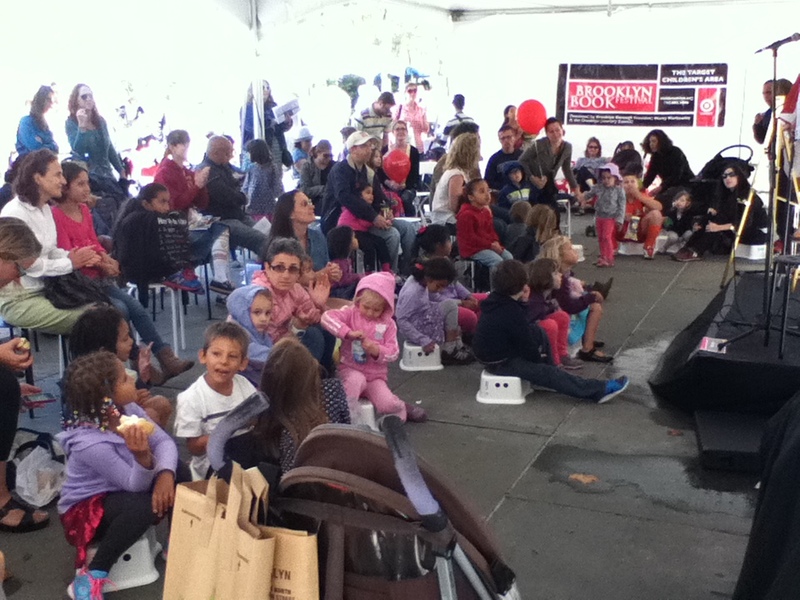 Since I attended the Brooklyn Book Festival with my two-year-old granddaughter, we spent time at the children’s area. We heard one of the Amelia Bedelia stories read by Herman Parish, nephew of the books’ creator, Peggy Parish, and an author himself. Herman Parish noted his aunt had actually known a cleaning lady who he thought provided a lot of ideas for the series. Unfortunately, the children’s area could have been more child-friendly. Some rugs covering the cement plaza, colorful posters, and floor pillows to go along with the small stools would have done much to attract more young readers. Being part of New York, Brooklyn, of course, had several well-known authors among its speakers. Claire Messud, Jamaica Kincaid, Ayana Mathis, Meg Wolitzer, Audrey Niffenegger, Tom Wolfe, and Edwidge Danticat joined a host of others in a full menu of presentations offered in tents on the plaza as well as in the Booklyn Borough Hall and other historical venues in the area. The main festival filled a single Sunday, although a series of “bookend” events were offered in the week leading up to the festival. 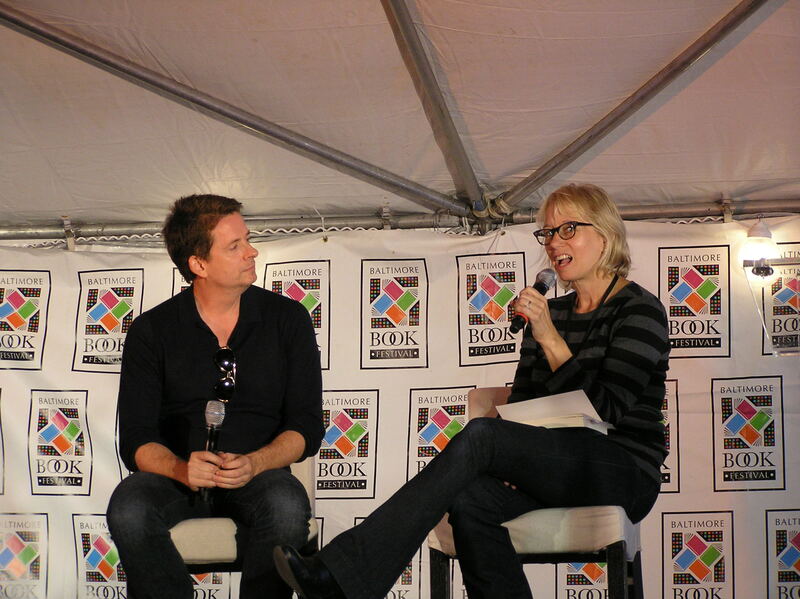 The Baltimore Book Festival stretched out over three days, encompassing an entire weekend. I was able to attend only on Saturday, but I had plenty of activities to choose from. In addition to the stacks of books for sale, authors available for signings, and author presentations, the Baltimore festival offered literary-related events, which I was eager to participate in this year. For example, Center Stage of Baltimore performed a one-act play, The Container, in an actual shipping container. Small audiences (10-15 people) went into the container with the cast, who portrayed a group of refugees fleeing to England. Talk about being close to the drama! It was great. I also learned a lot on a walking tour of the mansions and cultural institutions frequented by such literary icons as F. Scott Fitzgerald and H.L. Mencken in Baltimore’s Mount Vernon district. Speakers at the Baltimore Festival included, among many others, James McBride, John Searles, Laura Lippman, and winners of the Maryland State Arts Council individual artists awards for fiction. Searles and Lippman were particularly entertaining, giving lots of insights into writing and into Searles’ new novel, Help for the Haunted. Because it’s the books, after all, that are the stars of these festivals, and I left with a sack full at each event I went to. These are the stories and poems and facts that open our minds and lift us to another level of being. It’s only right that we celebrate these pillars of our culture. I just wish I could attend more. Next year I have my eye on the Virginia Festival of the Book in Charlottesville. What are your favorite book festivals? What do you like best about them? The Savannah, GA book festival is coming up this Saturday, Feb. 15. If you want to get out of the house, brave the weather and go. Featured fiction authors include Anton DiSclafani and Wiley Cash.